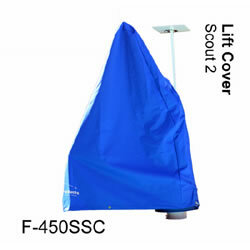 Keep your Aqua Creek Scout 2 pool lift safe with a custom-made lift cover. This protective cover keeps your Aqua Creek Products Pool Lift or Spa Lift safe from the elements while not in use. Available in Blue or Tan.